Submit Your Email Address, We'll Send You A New One. With FindLegalForms.com's innovative new Electronic Signature Service you can safely share and sign most documents from the convenience of your desktop, laptop or mobile device... No pens required, and best of all it's Free! Our system has been updated! We no longer require a separate access key (also referred to as an access code) for each document you want signed. If you previously uploaded documents using a key, please register above. Once registered, you can access the document by inputting the key on your account homepage. FindLegalForms.com Electronic Signature Service allows you upload, sign and share your document within minutes. No more scanning. No more faxing. No more waiting. And because your co-signors are provided the same service, the executed document can be returned to you in a fraction of the time. No special software. No apps to download. No headaches. All you need is the browser you used to open this website and you are ready to begin. 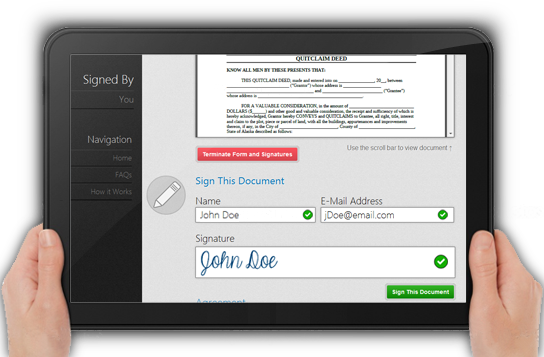 With FindLegalForms.com Electronic Signature Service, signing a document has never been easier. Your electronic signature will be legally binding, valid and enforceable in all 50 states - just as if you had signed a paper version of your document. Although electronic signatures are valid for most documents, a few document types have additional requirements (e.g. Wills). Please click on our FAQ link below for information on qualifying form types.